Statistics show that learning STEM skills early on better prepares kids for school and future careers. And not just STEM-related careers, but all careers, due to the fact that math skills are often such a powerful predictor of later learning. In fact, according to the most recent National Assessment of Education Progress (NAEP) report, 66 percent of fourth graders are not proficient in science and 60 percent were not proficient in math. So how do parents and teachers spark early STEM interest and introduce these concepts at a young age when children are most curious? One of the best solutions is to do so through interactive play, and the following products are designed to do just that. 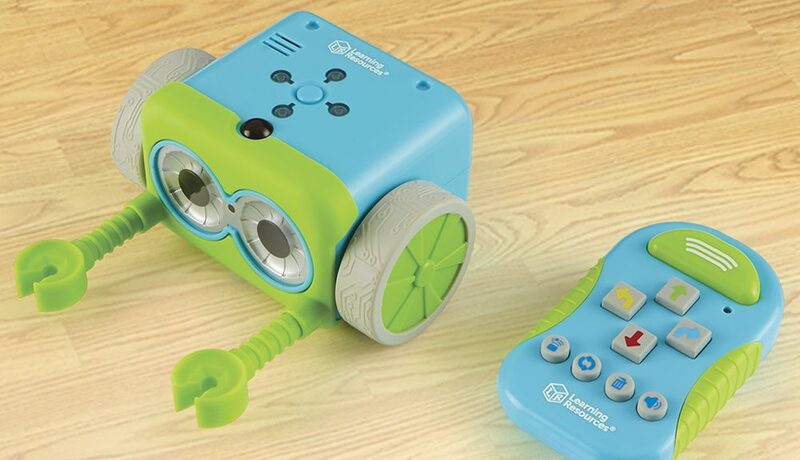 Winner of nine awards last year, Botley the Coding Robot Activity Set, by Learning Resources, is the first early coding robot to be STEM Approved by STEM.org for children as young as age 5. While it navigates obstacle courses, follows looping commands and detects objects, children get to learn early STEM skills and the basics of coding while playing and having fun. Completely screen-free, no phone or tablet is required. Instead, Botley has an easy-to-use remote programmer, which transmits commands — and off he goes! Perfect for promoting critical thinking and problem-solving skills. Kids love getting their hands dirty in this hands-on science experiment. The Beaker Creatures Liquid Reactor Super Lab allows kids to conduct their own bubbling reactions revealing collectible creatures from another planet! After placing one of two included Reactor Pods within the Super Lab’s center chamber, kids send water whirling through the tubes with the help of two Hydroplungers, filling the chamber and triggering the reaction. Once the reaction ends, kids can extract their Beaker Creatures collectibles and start classifying. The working lab set also comes with the equipment and instructions needed to perform amazing real-world science experiments inspired by the creatures and their home planets. Physics fundamentals become playtime fun with the Pendulonium STEM Challenge. This hands-on activity set challenges kids to send the included launch balls flying toward goal cups and targets with the help of a three-piece adjustable pendulum. What seems like a collection of simple tasks will actually challenge each child’s engineering, problem solving, and critical thinking skills as they play around with early physics concepts such as force and momentum in search of the ideal solution. Each activity set comes with a full-color booklet filled with easy-to-build challenges, which also ramp up in difficulty to encourage leveled play and continued development. ETA Hand 2 Mind STEM at Play BONES! This product offers children a chance to dissect owl pellets, helping them explore the world of biology and perform their own experiments. Discover what it’s like to be a wildlife biologist or veterinarian. Use the included lab tools to dissect real owl pellets. This STEM at Play product brings science concepts to life through hands-on activities designed to spark interest, inspire confidence, prompt creative critical-thinking skills while fostering collaboration between children and adults. This kit provides materials to support scholastic goals while keeping at-home learning fun. Kids get to dissect an owl pellet and identify animal bones (rodents, shrews, moles, and birds). They also can assemble real animal skeletons and conduct an experiment to turn hard bones into rubbery bones. This product lets children explore the science behind magnetism. They can use real lab tools and materials to perform amazing experiments and experience what it’s like to think like a scientist or an engineer. They become experts in all things magnetic. Children can work with floating magnets without touching them, use magnetic levitation to move a train, flip the field of their own iron filings, and create a compass. Children can grab their Educational Insights Nancy B’s Science Club MoonScope and take a tour of the nighttime sky, complete with visits to the stars, Saturn, Jupiter, and even the mountain ranges and craters on the moon. The Sky Gazer’s Journal is packed with fun activities, like learning about the lunar phases, writing a moon myth, drawing their own man in the moon, and more. It’s a telescope that gives a clear view of the nighttime sky and includes a moon filter, two eyepieces (to provide 18x and 90x magnification) and a built-in, pre-aligned finder scope with glow-in-the-dark ring to make it easy to use. The 22-page journal includes stories about the moon, plus fun observation activities. Read the question, jam to the beat, scan the possible answers, and slam the one that’s correct. Better move quickly, though, because each game of 13 questions is timed — the faster you get through the questions, the better your score! Incorrect responses are recycled until they are correctly answered. Three levels, flashing lights, and fun sound effects keep players interested. Previous article Get Ready: Camp Fair East & West Happening Soon!